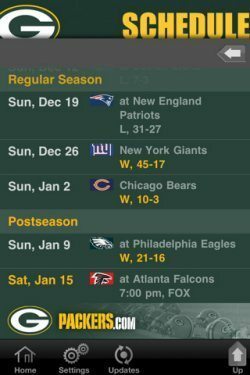 If you are a Green Bay Packers NFL fan you really should consider the iOS free app as this will give you all the news and much more you deserve. 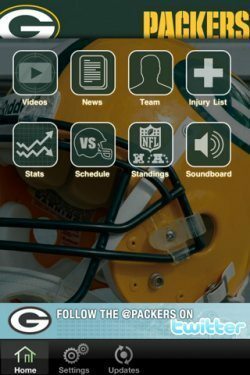 The official Green Bay Packers app via iTunes will allow you to get articles, up-to-the-minute Packers news, and updates from the team. If you want a great app that offers instant offline access then please read on. Main Features Include: Exclusive Packers Video, Up to the minute Packers News, Injury Reports, Depth Charts, it also will give you player/Coach/Staff Biographies, Packers Schedule, Current Standings and Stats. This app has received an update that includes new addictions such as: New Retina display icon, Retina display support for iPhone 4 and iPod Touch 4G, Added badges to home screen icons to signify new content, Added sticky headers to scrolling pages, Added support button to settings page, Added video support for iPhone 3GS and iPod Touch 3G, Improved download speed and load time and Various bug fixes. If you are a huge Green Bay Packers fan please do post all your comments below, we would love to hear from you. We would also like to know if you already have this free app installed on your Apple device and if so could you please send in your personal reviews.